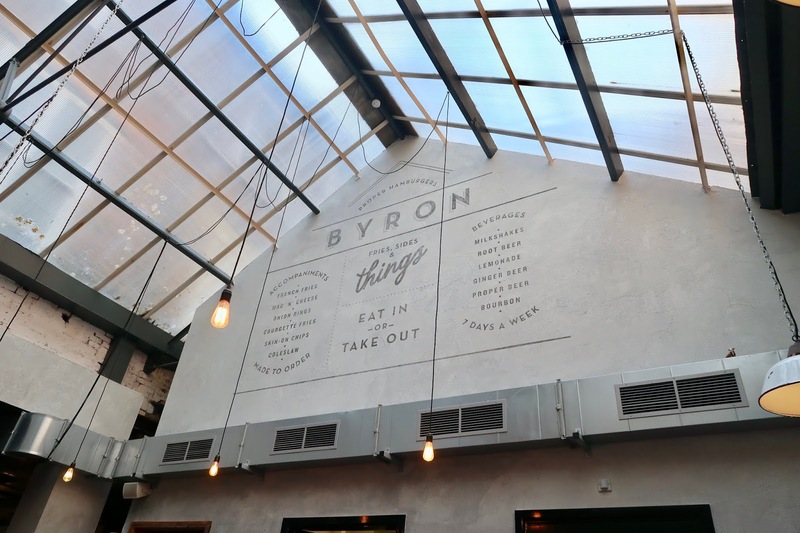 We visited Byron Burger in York the other day; I've been before but Kev hasn't and I wanted him to experience it as I really enjoyed the one I had in London (and I had my fingers crossed that they wouldn't disappoint). I'll be honest and say that on first impressions of the interior it's potentially not great; where we were sat near the back the booth seating looked like it had seen better days but I do also think that it's possibly part of the Byron branding - to be more hipster, cool and industrial rather than refined and sophisticated... it is a burger joint after all. We went in at around 12pm and it quickly started to fill up with customers which is obviously a tell-tale sign of their popularity. As you can probably see from the menu, Byron concentrate on burgers but they do offer beef, chicken or vegan options plus a selection of upgrades to your fries which is something I do like to see on a menu just to be able to switch normal fries for something a bit more exciting. Both me and Kev went for a B-Rex burger which is a beef patty, an onion ring, bacon, American cheese, jalapeños, pickles, onions, BBQ sauce and mayonnaise. We decided against the jalapeños because neither of us are particularly fond of hot food and although I don't mind jalapeños on nachos, that's about the limit of when I'll eat them. 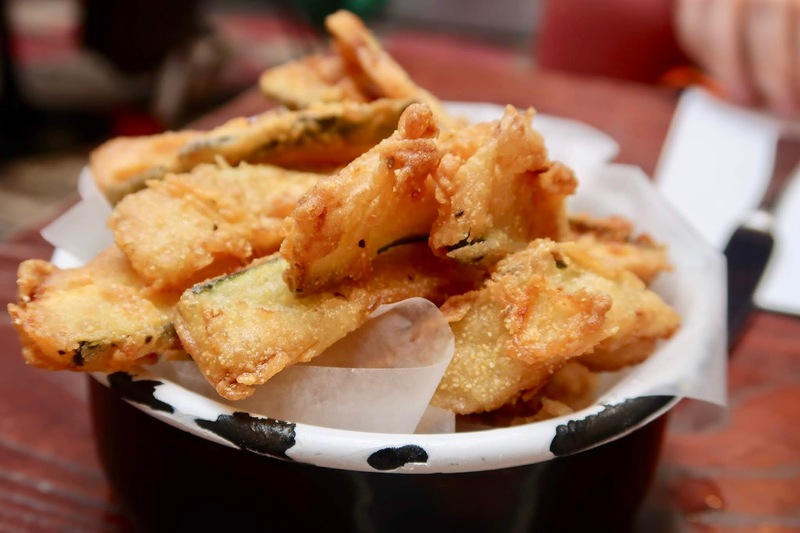 I also changed my normal fries for courgette fries which, if you haven't tried them, are an absolute must I think! I was very tempted to add cheese sauce onto normal fries but courgette fries win every time for me (they're actually one of the main reasons why I like Byron Burger). Both burgers are obviously photographed before we started eating them and I can confirm that they got a whole lot messier than that, which is another sign of a good burger in my book! They were incredibly juicy and the extra toppings were the perfect combination to make a really, really tasty burger. I particularly enjoy courgette fries; they did leave a little bit of grease in the bottom of the pot but I can deal with that seeing as they didn't taste greasy at all! 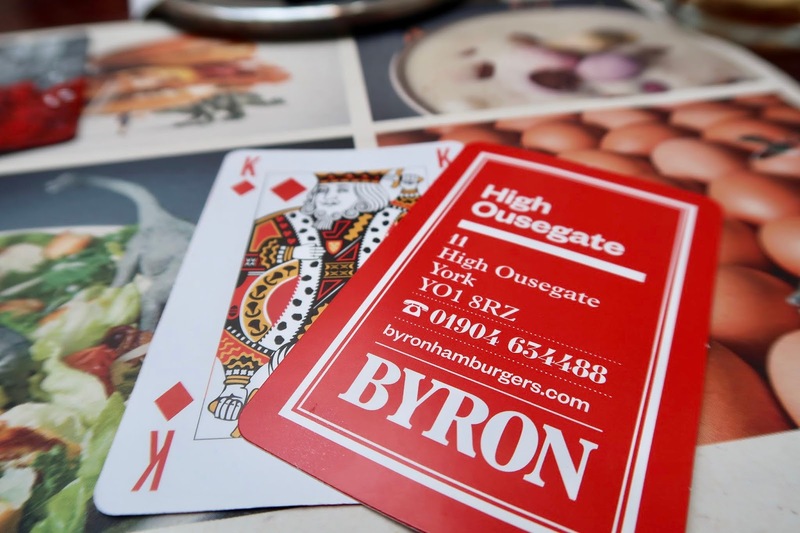 I can highly recommend Byron if you're partial to a good burger; the only slightly downside to anyone living up north is that they only have 4 branches north of Birmingham; the one in York, Leeds, Manchester and Liverpool but it's well worth a visit if you're in any one of those cities. 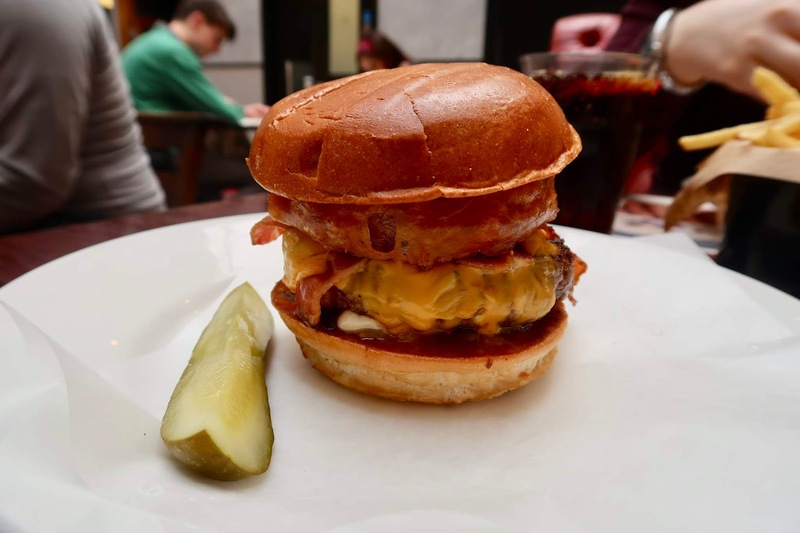 Where's your favourite place for a burger? 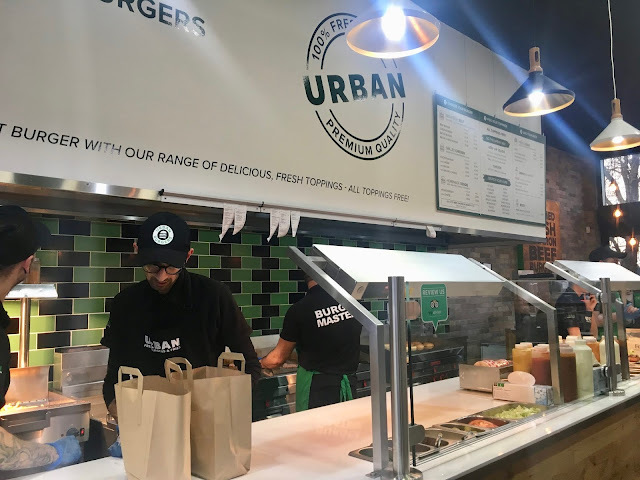 Decent fast food style burger chains are still few and far between in my opinion and you'd be forgiven for thinking that all fast food burgers are of similar quality to McDonald's but there's been a huge game changer that's arrived in Doncaster recently and I can't believe I've only just discovered it. Urban Fresh Burgers and Fries arrived down Wheatley Hall Road in Doncaster offering beef and chicken burgers as well as veggie options served with fries cooked in peanut oil (drooling face emoji). If you're from Doncaster or within driving distance, treat this blog post as a public service announcement - this is the quality of Five Guys but at a fraction of the price. A 'regular' burger is actually 2 'patties', with small being just the one. I went for a cheeseburger and Kev went for a bacon cheeseburger 'The Urban Way' which has lettuce, tomato, grilled onions, grilled mushrooms, pickles, mayo, ketchup and mustard. You can, of course, choose your own toppings from a huge list available on the board but The Urban Way is the only way for me. Considering these are fresh, premium quality burgers, the prices are so reasonable at £4.95 for a 2 patty cheese burger, the peanut oil fries are £1.95 for a regular portion (which is huge as you'll see further down) and the drinks are £2.95 (which may seem a little steep but they are refillable with a choice of 100+ drinks!). 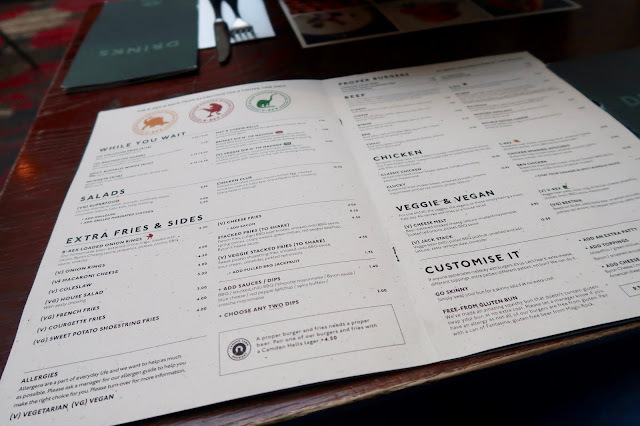 You can have a look at the full menu to find their chicken and veggie options. 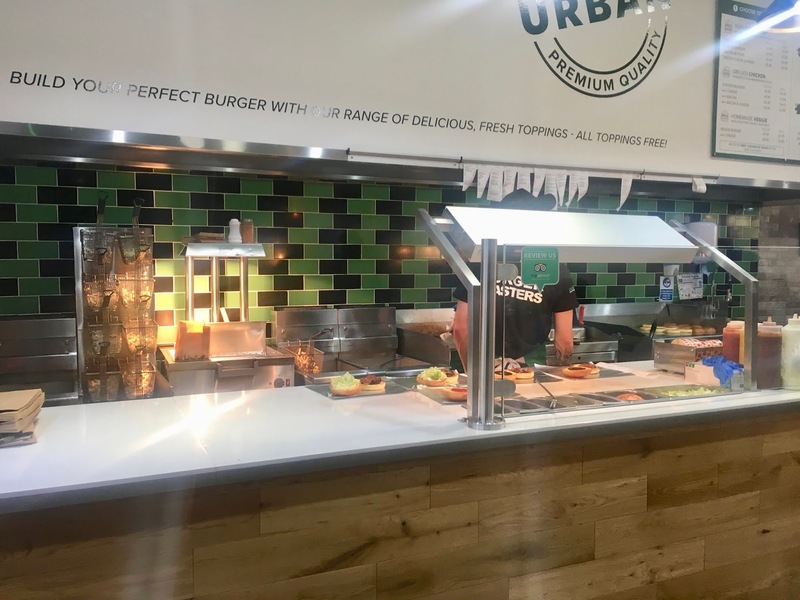 Preparing food in front of customers is a real winner for me - you see exactly what's happening with your burgers at each stage of making them and it shows how well and truly fresh everything is! 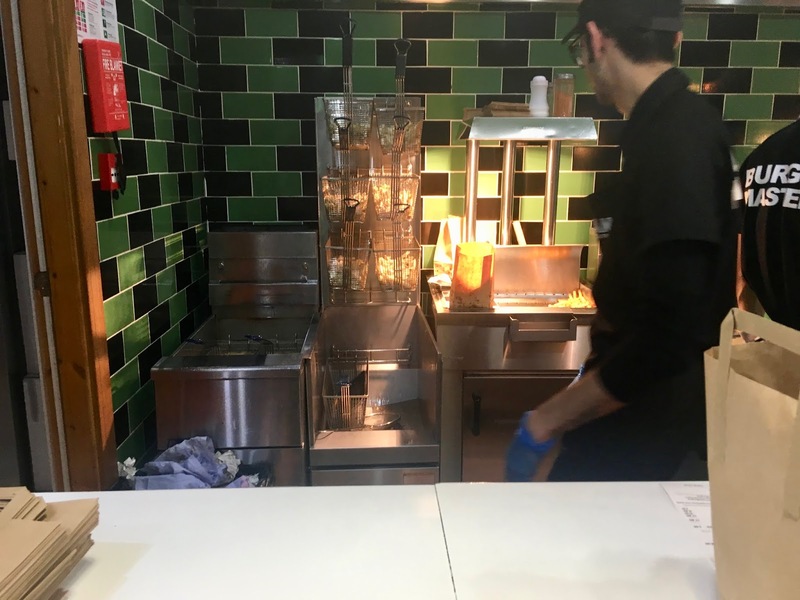 The staff are amazingly efficient at what they do and even at busy times you know they're working as hard as they can to keep your wait time to a minimum. There's variations of all sorts of different drinks so make sure you set aside a few minutes to browse the endless possibilities (I'd recommend Peach Fanta; Emma from Emma Drew Info recommended it to me and I can wholeheartedly say it's amazing!). 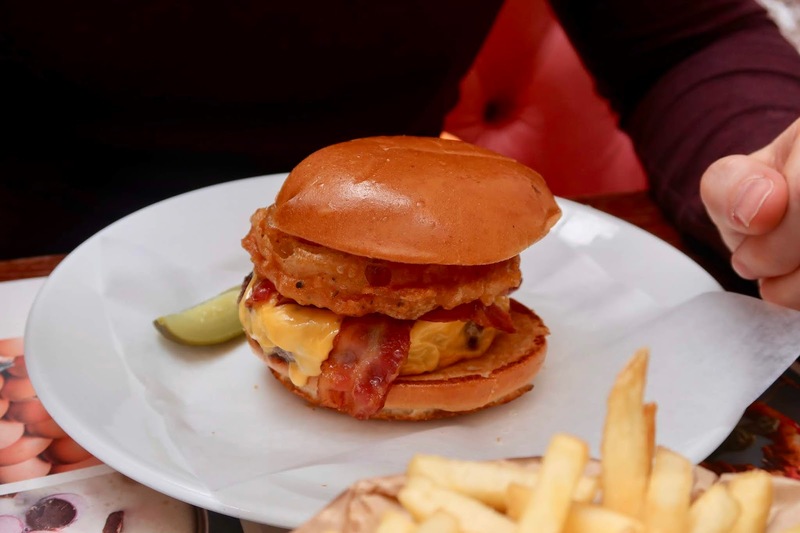 The burger is what I would describe as a 'dirty burger' and by that I mean that you are not going to come out with clean hands - it's every bit as juicy and amazing as a fresh 100% beef burger should be. 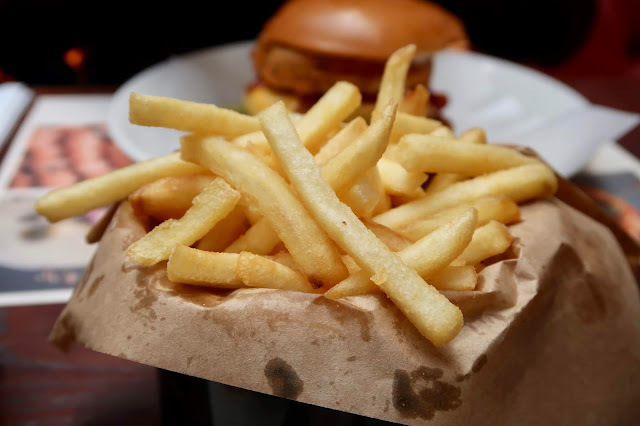 The Urban Way toppings go together perfectly and the peanut oil fries are an absolute revelation - you'll never want normal fries ever again! To see some amazing photos of their burgers head over to the Urban Facebook page (I don't eat in so by the time I've got mine home the photo just doesn't do it justice at all and you have to believe me that these are the most amazing fast food burgers in Doncaster)! They have additional stores opening at the brand new Lakeside triangle later this year and also one at Rotherham Parkgate - trust me, you need to try this. From switching up your colour scheme to introducing statement furnishings, there are a whole host of simple ways to improve your living space and ensure it exudes class, style and sophistication. To help you get the luxe look in your home, here are some quick, easy and surprisingly effective changes that you could make. You don’t have to completely rethink your furniture to enhance your home interior. By choosing a few new standout pieces, you could overhaul the look and feel of your rooms. For example, why not add an extravagant French-style bed to your boudoir? Perhaps a carved antique-look design made from solid wood would look the part in your bedroom, or maybe a luxuriously upholstered model with an opulent headboard would be a better fit. As the focal point of the room, this piece of furniture will set the tone for the entire space. To give your lounge a dreamy, decadent feel, have you thought about adding a sumptuous chaise longue? These pieces are all about indulgence. Meanwhile, if you have space in your bathroom, a roll top bathtub could instantly elevate the appearance of this space and create a spa-like vibe. The key is not to be afraid to step out of your comfort zone. To expand your home décor horizons and find pieces that really wow, it pays to browse home décor magazines and check out the options available on specialist websites such as crownfrenchfurniture.co.uk - and of course Pinterest always comes in handy too! Oversized accessories can give your rooms the designer look that you'll recognise from the glossy pages of home interior magazines. Something as simple as adding outsized mirrors to your walls can transform the appearance of rooms and make a bold, confident style statement. Go large with your artwork too. Hanging big prints can help to give your spaces a sense of purpose and personality. Geometric shapes and abstract designs work especially well when you’re going for the luxurious look. Forget drab fabric ceiling lights. By swapping standard fittings for showstoppers like chandeliers and glass and crystal pendants, you can take your home design up a gear. Make sure you have lots of mood lighting options too. For example, you could add some plinth lights to the bottom of your kitchen cabinets to bathe the floor in a warm glow. Hanging large pendants over kitchen islands or dining tables is another way to up the sense of luxury when it comes to your interior design scheme. Don’t be tempted to over complicate your colour scheme. Simple is usually best when you’re trying to create a plush effect throughout your home - and neutrals like calming cream or crisp white can work especially well. But to give your rooms some added flair, you could create feature walls in bold hues such as deep purple, intense red, dark grey or forest green. To take your feature walls a step further, why not use patterned and textured wallpaper? This tends to work especially well in accent areas such as alcoves or chimney breasts. To truly nail the opulent look, you have to pay attention to the finer details - and this includes making sure you use plenty of indulgent fabrics around your home. For example, you could embellish your bed or couch with cosy faux fur throws and place thick pile rugs on the floors in your lounge and bedroom. It’s also good to add detail to your chairs and sofas with beautifully coloured and textured cushions. Why not go for embroidered designs for that extra touch of sophistication and detail? These changes don’t take much time or effort, and you might be surprised by how much they can transform your home. I was kindly invited to review Sfinx, this in no way affects the validity of my review. Romanian food isn't something you'd necessarily come across up north, and it wouldn't be a cuisine that'd be at the forefront of my mind if I was going to pick somewhere to eat but when I was invited to try Sfinx, a Romanian restaurant in Sheffield, I was intrigued as to what it would be like and as you well know I love trying new places to eat in Yorkshire! When I first asked Kev and we looked at the menu, his first reaction was 'hmm, but are we going to like it?' 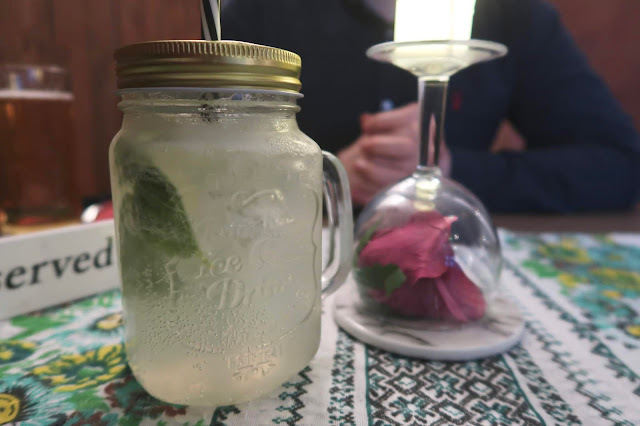 - there were things on the menu that we'd never heard of before and certainly had never actually tasted but I was determined to try it because I wanted to experience Romanian cuisine. On arrival we were greeted by the restaurant manager who was one of the most friendly gentlemen I think I've ever met and he quickly explained that we were no different to most British people in that we've never come across Romanian food before and we were pretty much clueless as to what to order so we agreed that we'd try a few different items from the menu to get a full Romanian experience. The atmosphere itself in the restaurant was smart but relaxed; it's clearly a favourite with local families. 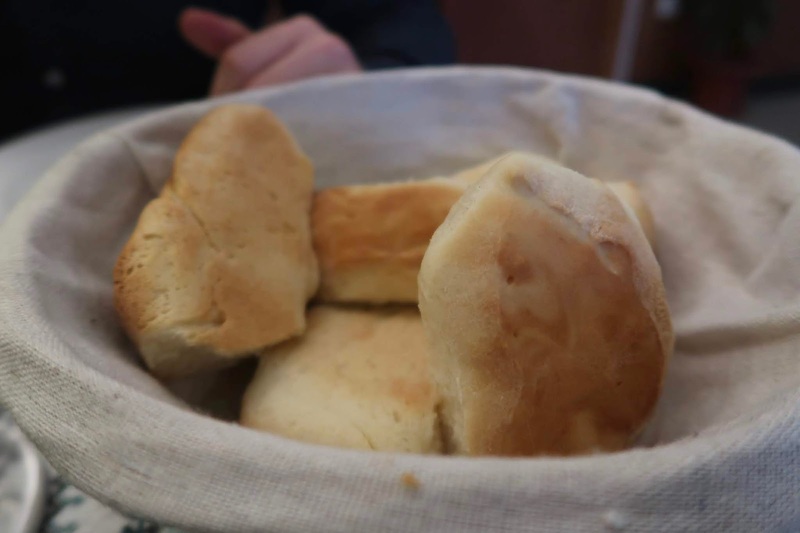 The host explained that Romanian food is a bit of a hybrid of different cuisines brought to Romania over the years from Bulgaria, Russia, Austria and Slovakia and most of it had been tweaked with their own blend of herbs and spices. All dishes are homemade in the restaurant so by the time everything had been explained, my initial reservations were gone and I was looking forward to trying some Romanian food. Then came the starters: homemade bread which was absolutely amazing especially because it was still warm served with a 'Sfinx Sharing Platter' which is devilled egg, aubergine & winter spread, cabbage roll, salad, pickles and olives. It's my ideal starter because I like little 'picky' bits as starters, especially when it's served with bread. My particular favourite was the aubergine spread (the lighter coloured one) which is made from baked aubergines, chopped onions and mayonnaise. It sounds so simple to make and it probably is but it is absolutely beautiful with the homemade bread. Cabbage rolls are made with seasoned ground pork, pickled cabbage and bacon, again, they were something I'd never tried before and I did wonder whether they'd be my cup of tea but they were so tasty! I knew I'd like the devilled eggs because eggs are among my favourite food - they're filled with chicken liver pate and in all honesty I could have eaten lots of those! The only part of the sharing platter that we weren't keen on was the pickles on the side but I do think that's purely down to our own personal tastes. 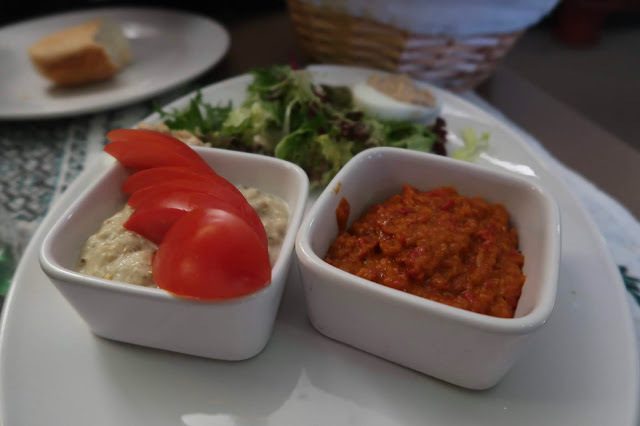 We spoke to the host and decided that we wanted to try a few different bits from the menu for our main course; we chose Hungarian goulash, Romanian stew and then a selection of Romanian speciality meats served with rosemary potatoes. 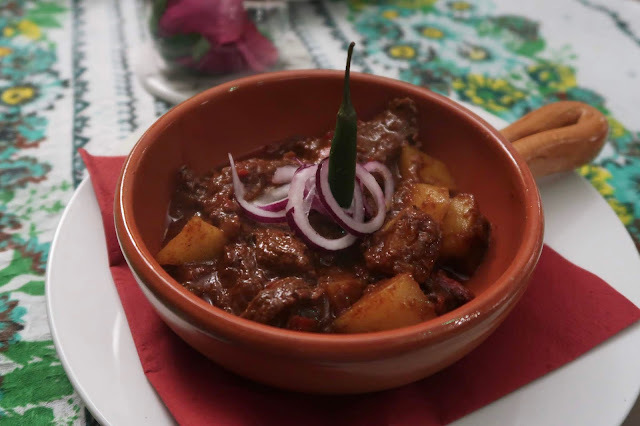 The Hungarian goulash is a mildly spiced beef stew, I double checked before we ordered that it wasn't going to be too spicy but the host explained that it was mild, served with a chilli so that customers could make it to their desired level of spice. The beef was so tender and was perfect with the potatoes, paprika and spices. It's one of those meals that just warms you up; a real comfort food. Romanian stew is a mixture of chopped pork, chicken breast, Romanian sausages, and mushrooms, blended with rich tomato sauce, served with polenta, fried egg and cheese on top. Polenta isn't something I've ever really tried before but it seems to be a bit of a Romanian alternative to chips and rice. It went really well with this stew in making it into another hearty meal. I preferred the Hungarian goulash whereas Kev preferred the Romanian stew but it was nice for us to be able to try both. The amount of meat on the platter was quite daunting after we'd eaten so much already but I was determined to try the Mici and pork collar which are two traditional meats eaten in Romania. 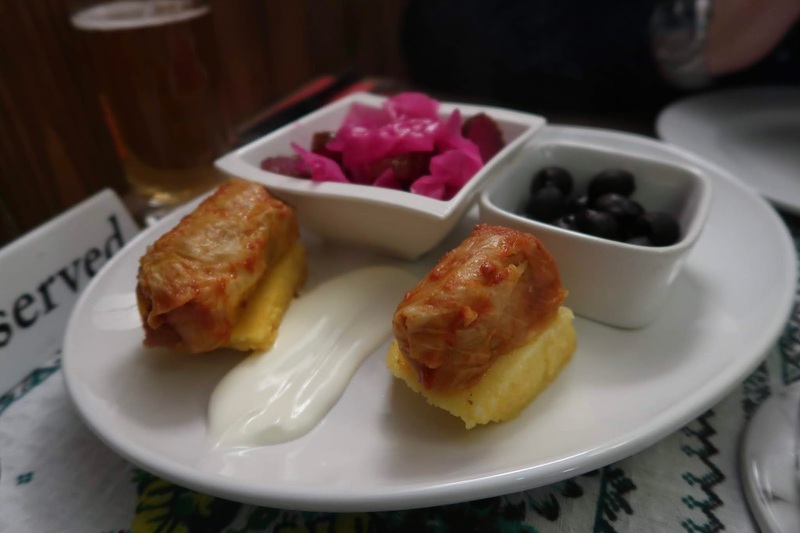 Mici are minced meat rolls made of a mixture of beef, lamb and pork meat with spices - they are extremely tasty and go really well with the Romanian mustard served on the side. The pork collar also surprised me because I associate pork with being a little bit dry but that's because as Brits we traditionally eat it as chops which is quite a dry meat but the collar was beautifully tender. The rosemary potatoes were something else; despite the fact that I was already full from all the beautiful food we'd eaten, I just kept picking at them because they were so nice! After giving us 10 minutes for our food to settle, our conversation with the host turned to dessert and we decided that we'd share one because we really wanted to try something but we wouldn't manage one each. 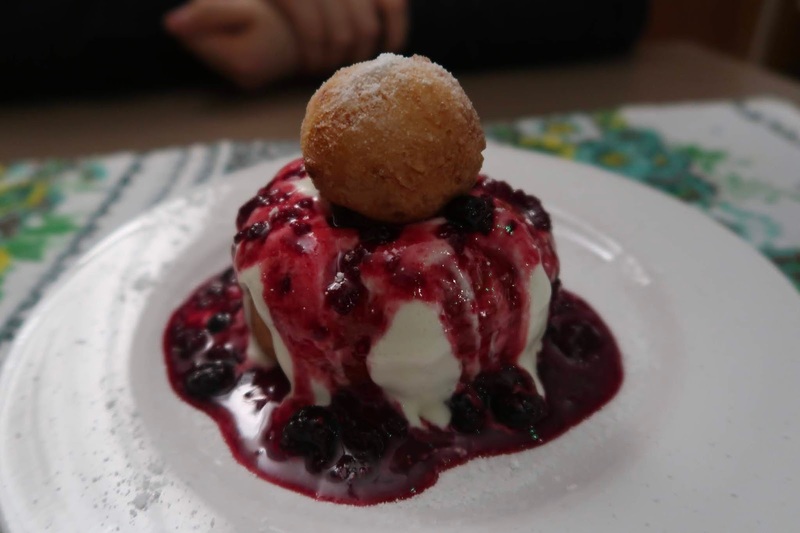 Papanash is the most traditional Romanian dessert on the menu so naturally we went for that. Don't be put off by the description of them being 'cheese doughnuts' because these are absolutely to die for. The way they're made makes them so light but equally indulgent at the same time; served with cream and wild berries you really have to try this when you visit Sfinx. I'd recommend Sfinx to anyone in the Sheffield area looking for somewhere new to try; if you let the host know that you're new to the cuisine he'll definitely be able to point you in the right direction but based on my experience if you try nothing else during your visit you absolutely must have the Aubergine spread and papanash... when I visit again I fully plan to try something different from the main menu but they'll remain my choices for starter and dessert! 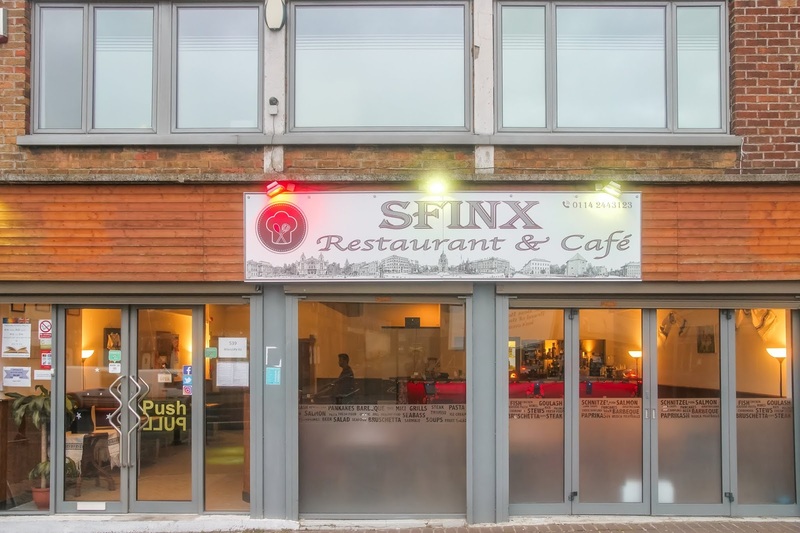 If you want to take a look at the menu before you go there's a copy on the Sfinx website along with lots of other useful information about location and opening times. Have you ever tried Romanian cuisine? 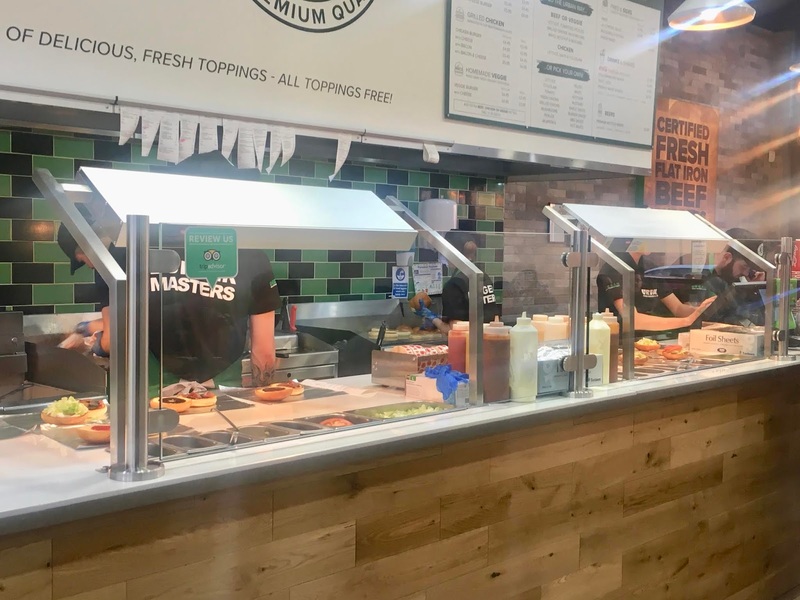 The York Roast Co. were the original creators of the explosively popular Yorkshire Pudding Wrap, and it's been so successful that they've trademarked the name 'YorkyPud Wrap'. You might remember that a while ago I went to try the Yorkshire pudding wrap at the York Roast Co. in York so when I was asked to return to try their limited edition ChoccyPud wrap you can imagine what my immediate response was! The ChoccyPud wrap is a limited edition sweet treat available at York Roast Co. locations in York, Shrewsbury, Salisbury and Chester until the end of April. Containing lashings of melted chocolate, chunks of gooey brownie, crushed Oreos and crumbly Flake, served with a dollop of cream, the ChoccyPud wrap is exactly how a dessert should be done with a Yorkshire pudding. I'll be honest and say that I was initially skeptical. I really like pancakes and could eat them until the cows come up but despite the fact that the mix for pancakes and Yorkshires is very similar, I've just never seen the appeal of things like Yorkshire pud with jam and other sweet toppings. However, given how the Yorkshire pudding wrap blew me away as a taste sensation, I wanted to give the sweet version a fair chance to impress. We obviously started with a main course of a 'no bread sandwich' which is beef with potatoes and veg in a cute little box but we were careful not to fill ourselves up and spoil the main event. Ok, so I know that opened up picture isn't necessarily the prettiest but it was the only way I could show how truly covered in chocolate it was inside! It was a very indulgent, chocolatey dessert that I can imagine would be just as good as a breakfast food (call it Yorkshire's version of a big pain au chocolat!) as it was so filling or when you've got that sweet craving after a night out (the York locations don't close until 1/2am on a weekend). It was absolutely full of melted chocolate as you can see from the pictures and despite my initial reservations about eating a Yorkshire pud with a sweet filling I really enjoyed it and left with my sweet tooth being suitably satisfied. The only thing that would have made it better would have been a little bit more cream (maybe served in a side cup). If this is something that tickles your fancy you have until the end of April to try one at one of York Roast Co.'s 5 locations (York Stonegate and Low Petergate, Chester, Shrewsbury and Salisbury) please do tag me in on Instagram if you go and try one and let me know what you think! Is it something you'll be trying for yourself? The EasiYo maker and powders were kindly gifted to me, I have not been paid to post this review. To me, this is the 'gadget' that you didn't know you needed in your life and when I say gadget I don't mean some hi-tech piece of electronic equipment - I actually mean one of the simplest little inventions ever. The EasiYo makes the tastiest, creamiest yoghurt which is totally free from artificial colours, flavours and preservatives and comes in so many different flavours from fat free natural yoghurt and low fat greek style yoghurt to everyday strawberry yoghurt there's so many different flavours and what's even more convenient is that Morrisons have started stocking the EasiYo makers as well as the powders. Why should I make my own yoghurt? 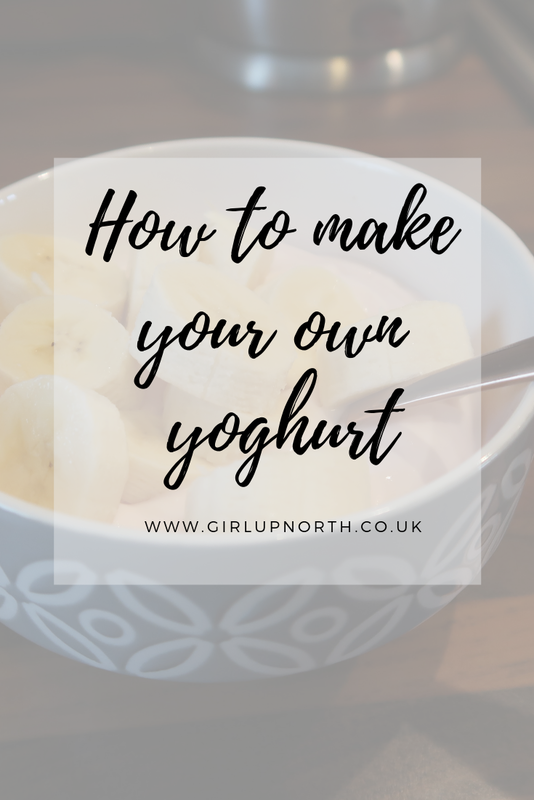 The EasiYo yoghurt maker makes making your own yoghurt into a simple 3 step process... but why would you want to go to the 'hassle' of making your own yoghurt when there's hundreds of different types that you could just go and buy from the supermarket? Well because a lot of the yoghurts we buy from supermarkets are full of artificial colours, flavours and preservatives whereas yoghurt made with EasiYo is all natural. 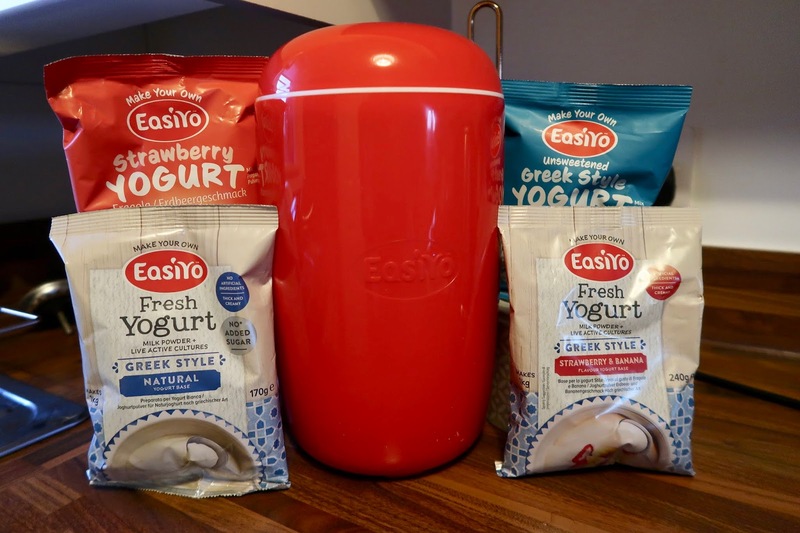 Also, yoghurt made with EasiYo is full of good bacteria, and yes shop bought yoghurt will contain some but because it's not totally fresh and has been made for some time (check the long dates on some yoghurts!) a lot of the good bacteria won't be anywhere near as effective at balancing your stomach as fresh homemade yoghurt. 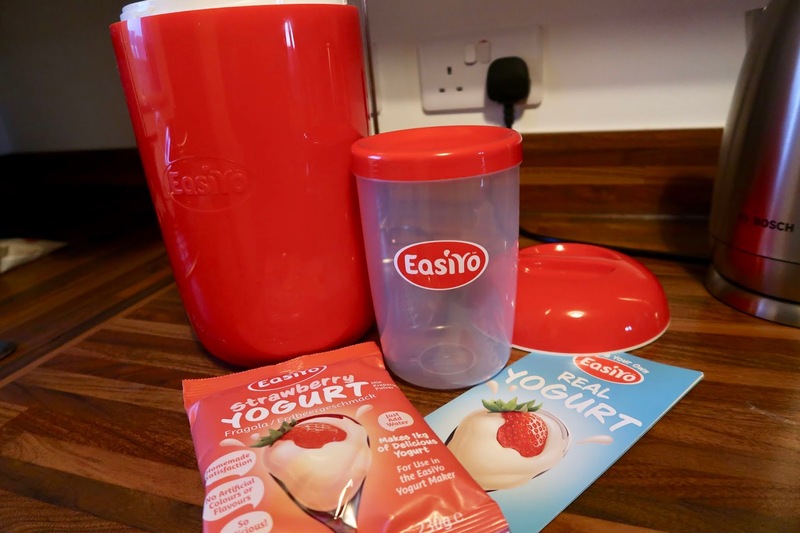 How easy is it to make yoghurt with the EasiYo? When I was asked if I wanted to try the EasiYo I genuinely thought I was going to receive some sort of machine but this is so simple. Once the 8 hours is up then you transfer it into the fridge and it should keep for 1-2 weeks; 1 jar is equivalent to 1kg of yoghurt and trust me, it's that nice, mine never lasts for 1 week never mind 2 and I'm on my own! I would, especially if you're looking for a yoghurt which contains more good bacteria than what you find in the supermarket. 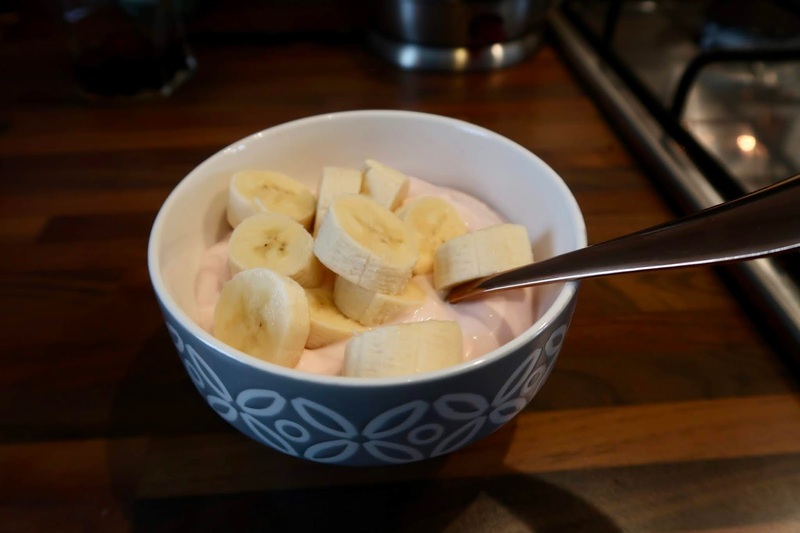 EasiYo yoghurt mixes do not contain any gluten and they are suitable for vegetarians. I also think an EasiYo maker would be fab for anyone with young children as it'll be a bit like magic for them and they can be a part of the whole process. At £21.99 for a starter kit, it's very affordable and can be bought in store in Morrisons so you should be able to pick one up with your weekly shop. 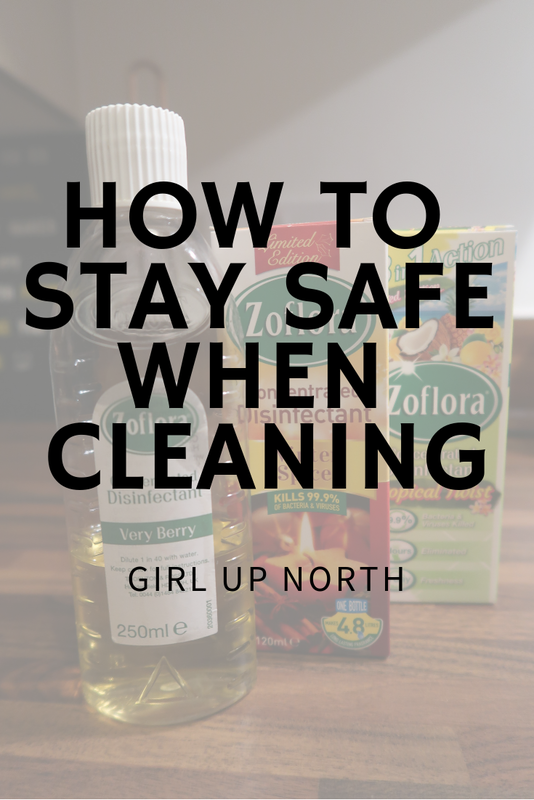 As I said in my post about staying safe when cleaning, cleaning has absolutely exploded over the past year or so and although I love cleaning itself and all the new products that have come from this trend, I've also realised that in the past I've bought so much stuff that I really do not need at all. Don't get me wrong I understand the appeal of a 'Narnia' full of all different cleaning products for different things but the truth is that actually you really could do without spending money on a lot of it. It's bleach. It's 45p. It does the job. I never buy Domestos anymore because although it's a household name in cleaning, I don't think it does a better job than this one for half the price. I don't actually use bleach for that much in the house but I do use it in my toilet. I don't see the point of pine disinfectant - yes it disinfects but I find bleach is a much, much more effective cleaner. TOP TIP: I see lots of people using boiling water when using bleach. Don't. Use bleach with cold water because boiling water destroys the active ingredient in bleach which makes it ineffective. This is one that I saw on Instagram and because it was only 90p I thought I'd give it a go. I use it mainly for my hob and my oven door and it is a really good degreaser considering that it's solvent free so you don't feel choked by it like you can do by some degreasing products. I had a stain on my sink for so long and had tried all sorts to get it off and nothing shifted it. This was the only thing that worked and although it did take a couple of applications and some scrubbing I was really pleased with the results. If you've got something stubborn on steel, brass, china, copper, chrome etc. then this is well worth a go. First experience of this was when Kev spilt blackcurrant on the cream carpet - you can imagine my reaction and my next move was straight out to get some of this. It worked an absolute treat and I've since used it on a really annoying stain on my car seat - a few years ago (yes a stain had been there for that long) a manky orange left a really weird white mark on the black material bit of my car seat and nothing brought it up but a quick go with this and it's totally gone now! I do feel like Zoflora is overused a little bit by the cleaning community but I do see the appeal and I always have a couple of bottles in. I generally use it for a bit of disinfecting kitchen tops and in the bathroom and soaking dishcloths overnight - I do like the smell and I thoroughly enjoy a good limited edition. What I don't enjoy is how many places have increased the price to £1.25 - buy it at £1 where you can! I live in an area where the water is really, really hard which means that limescale does build up on taps etc. quite quickly but this is amazing at making it easy to wipe away. Leave it for a couple of minutes, rinse off and it leaves everything so shiny! I have the Febreze version which smells really quite nice but it can be pricy in the supermarkets unless you have a coupon from somewhere like Super Savvy Me. I'm sorry, I'm just going to come out and say that I do not see the point in all the different cloths and sponges. I'm all for having different cloths for different rooms but I honestly can't see why those Minky things are so vital to a cleaning cupboard. I am speaking as someone who has never owned a 'Minky' and maybe it's just me and my stubborn nature but I just refuse to buy into it at the moment. I just have bog standard dish cloths, a scouring sponge and these microfibre clothes for buffing surfaces to make them shine. There are, of course other things in my cleaning cupboard such as 1001 carpet spray (at £1.99 a pop!) 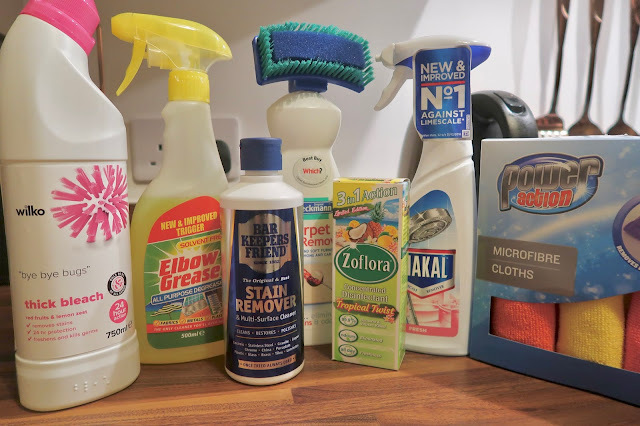 but that literally serves no other purpose than to make your carpet smell nice for a bit but these are just the things that I would suggest that you have in your cupboard if you're just looking for a no nonsense approach to cleaning. At just over £11.00 for the lot I don't think that's bad at all. What are your favourite cleaning products that you'd consider 'essential'? Never thought I'd see the day when cleaning became such a thing. Every year we kind of have a bit of a push around spring time for a 'spring clean' but ever since Mrs Hinch came onto the scene it's all just gone a bit mental. And it's great, don't get me wrong I actually enjoy cleaning now whereas I never did before (ironing though, nah... I'll never love ironing no matter how much nice smelling ironing water I pour into it) but it's also made way for some quite dangerous practices to surface that we might not actually think about fully when we're doing them. Thankfully, there are instagrammers like The Secret Cleaner that seem to be quite savvy with their chemicals and things and have unearthed some of the dangerous things that we might be doing and not necessarily know about it. 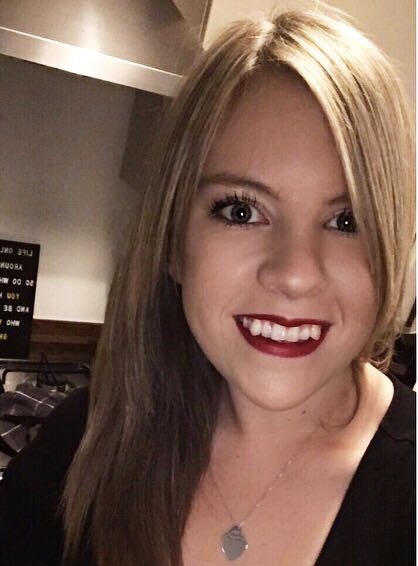 You might have heard about the woman from Sheffield who ended up with chlorine gas poisoning when she mixed bleach with disinfectants and hot water - she had no idea of the reactions that can occur when you mix certain chemicals. I don't profess to be a chemist but it does clearly say on the back of many cleaning product bottles not to mix them with other chemical cleaning products. Combinations such as bleach and vinegar also create chlorine gas, rubbing alcohol and bleach creates chloroform (this is what's often 'used' in films when someone puts a cloth over someones face and they collapse unconscious on the floor)... there's so many dangerous cleaning product combinations that you need to be aware of. 2. Use cleaning products for their intended purpose. Another example that springs to mind is fabric conditioner, we are obsessive about having our houses smelling nice and I've seen so many people diluting fabric conditioner in a spray bottle and spraying it all over their curtains, bedding, sofas etc. Fabric conditioner can decrease flame resistance; especially when it is not used as directed. It does specifically say this on the back of the bottles aswell. So by using it in a trigger spray bottle, although diluted you are not rinsing it away which is what happens in a washing machine therefore, you could be putting yourself and your family at risk if the worst were to happen. Buy a bottle of Febreze or something else intended for eliminating odours on soft furnishings etc. Similarly, don't put anything like Zoflora or those fabric conditioner balls into a wax burner... they were not made to be near naked flames and they most certainly should not be put in that situation! I love a nice smelling home as much as the next person and I've got candles and reed diffusers galore to help with that but I know that lots of people use products like Zoflora to help with odour elimination. If you are going to use Zoflora (in the correct way), or any other cleaning product, always make sure that you open some windows to ventilate the area because as much as you might enjoy the smell of these things, prolonged concentrated inhalation of chemicals can cause headaches and more serious problems such as lung complaints long term. Sounds totally obvious but make sure you read the label regarding what can and can't be used around animals and how it can be used safely and again, obvious tip but don't let your child near any freshly cleaned surfaces and floors. Lots of people are turning back to natural cleaning products which pose much less of a risk so that is also something to consider. Possibly the most popular place is under the sink but somewhere higher or with a child lock on might be a safer bet if you have wandering little hands. I know storage can be a huge issue in new build houses, particularly smaller ones like my little 2 bedroomed and it can be tempting to make use of every available space. Lots of people use their boiler cupboard as storage for other things by putting racks on the inside of the door etc. but near a boiler is not a place to store cleaning products. It goes back to the old highly flammable chemicals thing. A boiler has a pilot light inside it which is a naked flame. Naked flames and flammable liquids don't mix well so keep your cleaning products at room temperature in a sensible location. Chemicals and bare skin are not a good combination. When I first bought a bottle of Zoflora I was daft enough to use it a few times with a cloth and no gloves on, then I wondered why my hands were becoming more and more cracked and dry. It was the Zoflora. A good old pair of marigolds should protect you from that and any other chemical burns that could potentially occur! Top and bottom of this advice is mainly: read the instructions and think sensibly and logically when you're cleaning. I'm not writing this to kill the 'joy of cleaning;' I just think that there are so many people who are unaware of the potential dangers that they're putting themselves in the way of by not using cleaning products properly. Do you have any interesting tips for cleaning safely? Natural light makes us healthier and happier. If we’re surrounded by artificial light 24/7, our health is going to suffer. 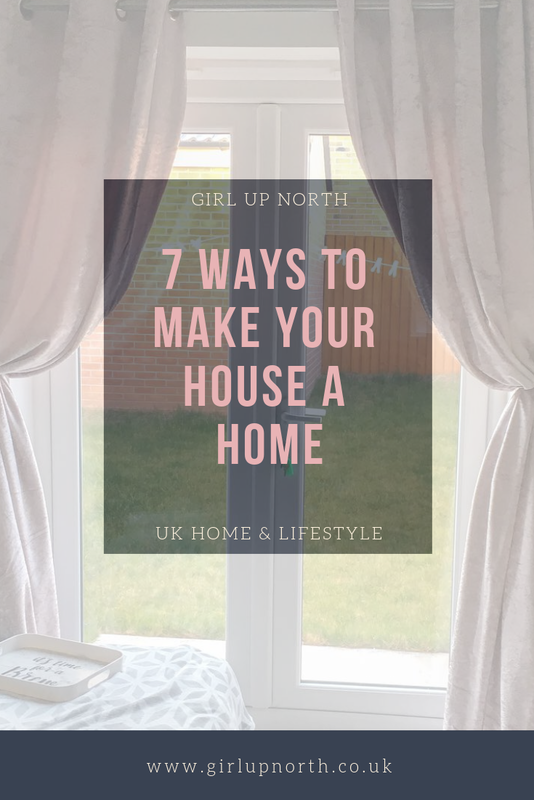 Opening up your curtains or blinds to let in more natural light, and even having bigger, better windows put in could help you to brighten up your home and feel happier there. In all honesty I've got vampire tendencies where light is concerned and I'll quite happily sit in the dark on my laptop but it does lift my mood so much when I open the patio curtains. Accessories have gradually been introduced into my house and I always make sure that whatever I do accessorise with actually means something to me. Make sure you take your time when you choose your accessories, and that they really speak to you. For instance, art on the walls is a very personal thing, so you need to choose pieces that will make you happy in the long term, and not just pieces that you think will impress guests or go with that particular temporary colour scheme. Remember, it’s better to have larger, fewer accessories that you really love rather than lots of smaller ones cluttering up your space. I particularly like prints as wall art because they don't necessarily rely on a certain colour scheme and I also love the wire initials that I have from Next because they're totally personal. Spending a little more on your furniture is a good idea, as you’re going to be using it an awful lot. It’s especially important to ensure it’s suitable if you have kids and pets. Will it stain easily? Will it last with lots of use? I had a bit of a dilemma when I bought my house in that I really loved a sofa from Next but obviously, being Next, the price tag was pretty hefty. However, I'd looked high and low and nothing came close in terms of how much I liked it and I just thought a sofa is something you sit on every single day and if I don't totally love it I'll regret it in the long run so I ended up splashing out on the Next Stamford. You shouldn’t let issues in your home go on for too long before fixing them. This can bring the overall energy of the home down and end up costing you far more in the long run. Electric Cooker Repairs should be taken care of ASAP (mine was making a really loud rattling noise when I moved in, which could have been anything but luckily it just needed readjusting and it's been fine ever since). As well as things like holes, cracks, draughts, and so on; just because they’re small doesn’t mean you should leave them... which reminds me, my settlement cracks are in desperate need of filling in! Plants and flowers look beautiful, and they have been proven to influence mood. Not only that, plants purify the air, making your home healthier. Aldi and Lidl often have some amazing deals on flowers and plants so it doesn't have to cost a fortune; a small bunch of tulips is usually only £2/3 and they do make all the difference. Although you might think this is clutter, sentimental items can actually make you happier. I actually encourage my niece to draw and make me things because I love displaying them but obviously there's no better source of sentiment than photos - I make sure I print them from my phone every so often so I've got hard copies to put into albums/frames. I also tend to buy magnets of some kind wherever I go so I've got a reminder on my fridge of where I've been and the amazing times I've had; I'm always looking for other quirky ways of displaying souvenirs though! Do you have any other ways that you've made your house into a home? On Instagram, I've made no secret of the fact that my most hated room in the house is my bathroom; it just feels so drab and boring firstly because I picked totally the wrong colour of tiles; I went for a cream colour because I figured it was neutral and easy to work with but it's just made it so lifeless. Also, Persimmon weren't kind enough to tile all the way around the bath despite the fact that the main bathroom in Morden houses comes with a shower over the bath so clearly you'd need the whole wall protecting, not just some of it. Anyway, I digress. In terms of renovation, as much as you shouldn't have to do that in a new house, the bathroom is definitely something I would love to inject some life into and here's what I've been considering when planning what I might want to do. When it comes to the value of your home, your bathroom plays a huge role. Bathrooms are no longer used simply to meet practical needs; they’re now a place for relaxing and pampering. After all, who doesn’t love a bit of “me time” and a long soak in the bath? Before starting any big home renovation task, it’s worth thinking about what you hope to achieve so that you can understand your basic requirements and the space you've got to work with. 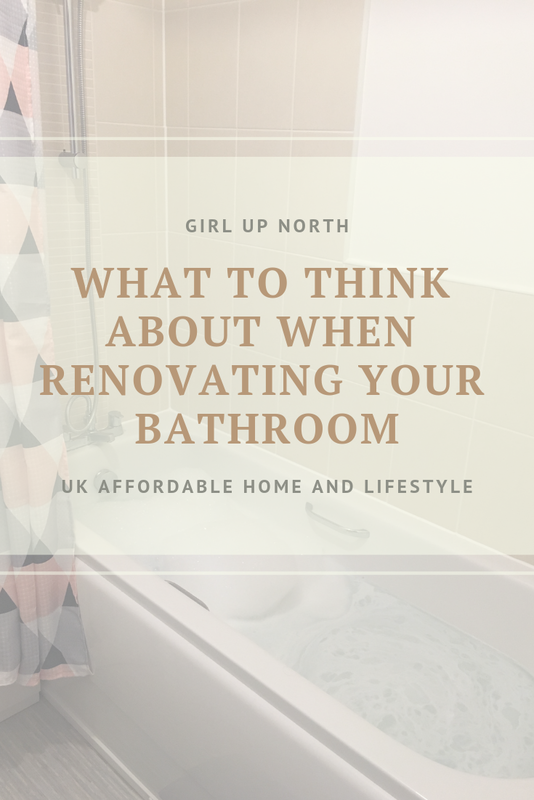 Obviously my bathroom isn't very big with my house only being two bedroomed so the basics such as the bath, toilet and sink would have to stay in the same places really but I need to take advantage of every bit of space I have for storage. The tiles would be an obvious change I'd make to transform the colour scheme; I'm thinking grey but I also wonder whether that trend is fading. Some patterned tiles might be nice because I've seen some amazing ones in other people's bathrooms. Cost is a huge element for me and I simply don't have the money to be throwing around on unnecessary things so actually what my renovation would focus on would be making improvements to the existing fixtures. So instead of changing the full bath suite I'd look at a new bath side panel - I've seen some really lovely different shapes and finishes in places like B&Q - they even do ones with built in storage which would be amazing. Also, I've looked at painting the tiles as opposed to replacing them completely because I think pulling them off will be a bigger job than anticipated because I think the wall would have to be re-plastered but I do definitely need the rest of round the bath finishing off so it's swings and roundabouts really with that one! In rooms where there is lots of moisture in the air, such as bathrooms and kitchens, appropriate ventilation is very important. If you don’t think about bathroom ventilation before you start your project, you’re sure to regret it later on because you’ll start to notice damp and mould growth. I have got a window in mine but I know not everyone has that luxury, especially in terraced houses. All you need is a domestic ventilation fan to help keep the newly renovated room fresh and airy. There are plenty of silent fans on the market so as not to disturb your relaxation time. To be fair, I'm really pleased with the light I bought from B&M the other week; it was only £12.99 and it's so effective; I feel like it's really brightened up the room. Ideally I'd love a dimmable light in the bathroom just so I could turn the lights down when I was having a bath but to be honest it's absolutely fine just turning the light off and lighting a candle instead when I want to have a super-relaxing soak! Do you have any quick fixes for bathroom renovations? This goes a lovely shade of purply-blue when you add hot water and the taste of blueberry really comes through. I've found that one of the tricks to most fruit teas is to make sure you do leave them to stew for around 3 minutes to get the most out of the teabag. This one smells absolutely amazing as it's steeping; and tastes just as good. I find this one is a really refreshing tea good for a morning cuppa if you're not feeling coffee or breakfast tea. I don't think it would be a tea post without including good old Twinings would it? They do hold a Royal Warrant so it's not surprising that this is my go-to peppermint tea of choice. I usually drink peppermint either after a big meal or before bed because I find that it settles my stomach and it's just a nice caffeine-free relaxing kind of tea. A recent discovery of mine, these tea bags are what I would refer to as 'posh' ones becuase they're made of really thin meshy material which just makes them a cut above the rest. Obviously you do pay a premium for these types of tea but I really enjoy this one as it's the perfect hybrid between mint and fruit. Next on my list for my little collection of teas is to try some loose leaf tea and invest in one of those cute little stump teapots that have a built-in filter. What are your favourite teas? It's not often I venture out for breakfast/brunch but when my step-sister introduced me to the little gem that is 'Feast' in Bawtry I had to share it because I'm really keen that small businesses get the recognition they deserve when they do something well. It is a really inviting little cafe and you're always greeted with a smile from the lady who I assume is the owner. Their all-day brunch menu is where I've ordered each time I've visited but they also do a selection of sandwiches, toasties and hot specials for lunch. The prices are reasonable, especially as you'd be forgiven for assuming it'd be expensive given that it's in Bawtry; from £5.95 for a toastie to around £9.45 for a full English breakfast. 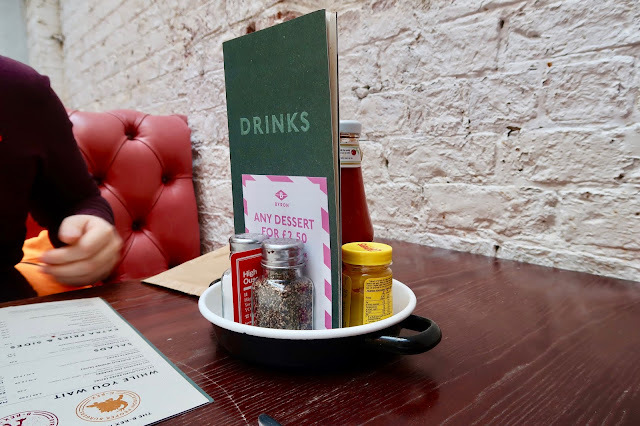 The choice of drinks is huge, as you can see from the menu above but I went for a simple English breakfast tea for two (I went with my dad) which came in this huge modern teapot accompanied by a cute little milk bottle. You also get a tiny little biscuit with your tea (which was long gone by the time of this photo!) which is just a little taste of their homemade goods. I have been to Feast twice so I'm going to show what I ordered on both occasions; all choices are from the all-day brunch menu. This was Kev's choice the first time we visited and he commented on how much he loved the toast which looked like it was the most amazing thick cut bread with plenty of butter. This is a lovely little option if you don't want a heavy breakfast but you still love the idea of a full English. This was my first choice and actually wasn't what I expected; I expected the scrambled eggs to be separate from the salmon but this actually worked really well; there was plenty of scrambled egg and I really enjoyed it. I actually got this after seeing my step-sister have it on our first visit. She actually had hers minus the tomato and mushroom so if you do have any specific requests make sure you let them know and they'll happily accommodate if they can. I was a bit hesitant about the sourdough toast but again, it really works because it's not too stodgy with the avocado. The poached eggs were cooked to perfection with an amazingly orange runny yolk. I thought this was quite unusual to see on a menu in England and it reminded me of 'Hash House a go-go' in America. This was my dad's choice and he said he really enjoyed it; there was plenty of chorizo and it definitely looks like something to have if you're wanting something a bit different to the usual cafe options. I can say with 100% certainty that it won't be the last time I visit Feast and I highly recommend that you try it if you live in the Doncaster area. I also noticed on my last visit that they do 'cronuts', is a hybrid of a donut and a croissant, which I fully intend to try if they have some next time I'm there! You can find out more info about them on their Facebook page, no need to book, just turn up and hope there's a table available!